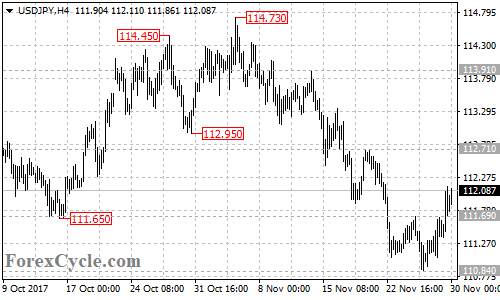 USDJPY broke above 111.69 resistance, indicating that the downtrend from 114.73 had completed at 110.84 already. Further rally would likely be seen, and next target would be at 112.71. Support is now at 111.69, only a breakdown below this level could bring price back to test 110.84 support. Below this level could signal resumption of the downtrend, then next target would be at 109.50 area.